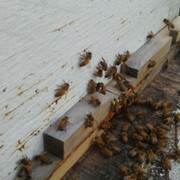 Two bees on 2nd pic a little blury. But every 3rd bee is bring this pollen. Thanks for the pictures, Mikey. Do you know what kind of pollen their bringing in? Not sure. There's goldenrod, another weed looking plant same size as goldenrod but with white flowers also i noticed some of the older Bradford pears are having a 2nd small bloom. 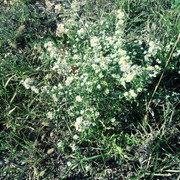 The white flowers could be asters. They are usually the last to bloom around here. Do they look similar to this? All asters produce a yellow pollen. Do you have morning glories blooming? Yes , after Florence, a week an ahalf , noticed the purple small morning glory's. On headge rows an ditch line. Today still the same, lots of off white. Big baskets full and small orange. about this time in Central Texas we get a good bit of stuff coming in from morning glories and asters... the asters evidently will keep producing a small quantity of pollen even after the first freeze..